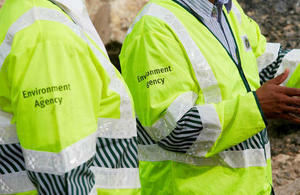 The Environment Agency is playing an active role in this month's Magna Carta anniversary celebrations. The Environment Agency is looking forward to playing an active role in this month’s Magna Carta anniversary celebrations taking place on and close to the River Thames. Over the weekend of 13 and 14 June 2015, the River Thames will be host to a community event which will include a spectacular two day river relay and pageant from Hurley to Runnymede. On Monday 15 June a national celebration will also take place close to the river on Runnymede Meadows. In our role as navigation authority, the Environment Agency is committed to support the event organisers and community partners in making the celebrations a success. Some river restrictions will be in place across the three days with heavier than normal river traffic expected between Hurley Lock and Bell Weir Lock on 13/14 June. As the navigation authority we will be maintaining a clear channel and limiting the disruption to all river users during the event, whether they are taking part or passing through. On Sunday 14 June the pageant event will be using a buoyed channel in front of the Runnymede Pleasure Grounds on the south, Egham side of the river. From 08.00 to 18.00 regatta boards will mark the navigation channel which will be established on the north, Wraysbury side of the river. The event on Monday 15 June has been organised by the Magna Carta 800 Committee. To support a Surrey Police request for the safety and security of boats using the river on the Runnymede reach, there will be a short period river closure from 09.00 until 11.45 from the Bells of Ouzeley public house to the Runnymede Pleasure Grounds. The weekend relay and pageant will see the Queen’s Row Barge, the Gloriana, lead the way for boats from local clubs and organisations between reaches. The flotilla will feature a mix of powered, unpowered, vintage and new vessels of various sizes. The pageant will grow in size as it makes its way towards the final destination, Runnymede Pleasure Grounds. As the pageant moves down the river, it will stop at several locations for ‘playlets’ which will re-enact important historical scenes. We are proud to support this wonderful event which celebrates the sealing of the Magna Carta beside the Thames. We have taken the needs of boaters and community partners into full account when developing our navigation restrictions, to strike a sensible balance between the needs of the event and the rights of our customers. There may be limited availability of some public moorings on the reach during the events, if you plan to moor on the reach during this time we advise you to check availability before you depart. We know that all responsible boaters will respect and comply with our restrictions and in doing so, will be doing their bit in making this event enjoyable for all.